New, Free, City-Wide Recruitment Tool Launching! 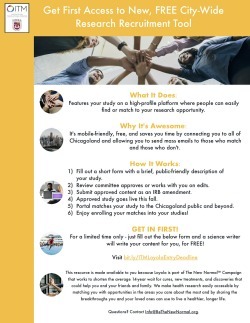 Save time and money by featuring your study on the a new, high-profile platform where people can easily find or match to your research opportunity. 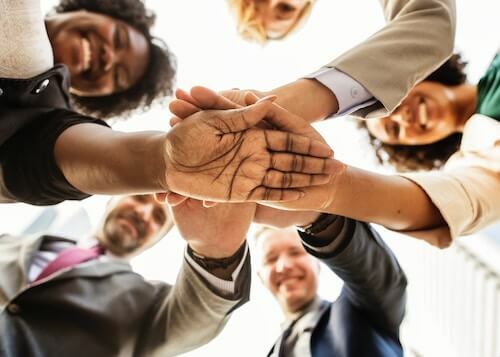 It’s mobile-friendly, free, and connects you to all of Chicagoland, and allows you to send mass emails to those who match and those who don’t. And once your study is in, the tool works for you automatically so that you can be doing other things while it compiles interested potential participants. You can easily access a list of matches, connect with them, and enjoy consenting them into your study. 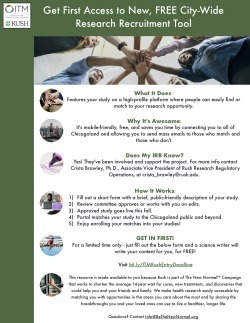 This resource is made available to you as part of a campaign to increase awareness of and participation in health research in order to shorten the average 14-year wait for cures, new treatments, and discoveries that could help people live healthier lives. Learn more – Download Your Institution’s Flyer Here! 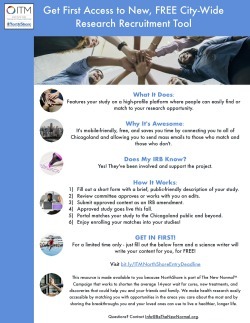 Just Three Clicks – Submit Your Study For Science Writers Here! For a limited time only – just fill out the below form for your institution and a science writer will write your content for you, for FREE!